I've been back in the United States for almost one month now. However, it doesn't take much for my thoughts and my heart to get pulled back to Kenya. Just yesterday, I saw a guy on a motorcycle with a cooler strapped on his back seat and I immediately thought of Iten. Many of the athletes I met at the HATC (High Altitude Training Center) have run the races they were so dutifully training for in Iten and their social media updates remind me of the hot, dusty days spent on the roads cheering them on as we walked home from school. Facebook still seems to think I am in Kenya since it advertises things to do in Nairobi and Mombasa as well as trying to sell me hair extensions. Every time I eat real ketchup, I savor it while thinking back on the various pink sauces that were proffered as condiments in Iten. I guess I missed food from home more than I thought since I still find myself drooling over the smell of Dr Pepper, Mexican food, and ranch dressing. One last pop at Mama Brian's! Our favorite spot to sit, relax, and watch the village after class. Scores of people have asked me about my trip. I find myself using the adjective “dynamic”. From the range of characters I met, the variety of foods eaten, the smorgasbord of weather situations, and the assortment of modes of transportation... it's so much to process that I thought I would be able to write my summary blog post a while ago. After all, I did fill a 300 page journal in just 6 weeks! Now that the project is officially completed and Alyssa is back in the country, I'm ready to reminisce. I miss the girls. They were so positive and energetic. I feel like there is so much more we could have taught each other. I miss their smiling faces, adorable accents, obsession with stickers, and especially our chats on the walk home. I miss seeing them sprint their hearts out at Sports Day. I miss feeling productive and useful as a teacher. Honestly, though, there are some things I don't miss, mainly the feeling I got when I realized there were limits to how much I could help: like when I saw hurt and hungry children by the roadsides, or the elderly coping with extreme poverty. Last Day at Kamariny Primary School! Will I go back? Realistically, probably not. Instead, I will direct my resources to the existing organizations, like Cross World Africa and the Golden Girls Foundation, and continue my volunteering efforts at home. Once I returned back to Colorado, I started giving my time to the Durango chapter of Days for Girls. 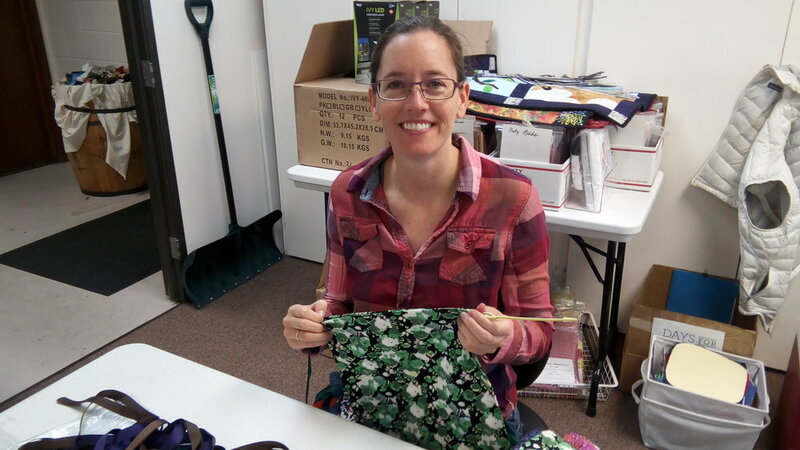 They sew and distribute kits of underwear and reusable pads that get donated all across Africa. The need is very real for the women over there and I am happy to continue aiding in the fight for menstrual equity. While I love my Ruby Cup and believe in it's utility for the older secondary female students, I couldn't help but wonder if our primary students were a little too young to benefit from the product. This made me start thinking that a better sanitary solution for the younger girls would be reusable pads until they were older. I will never forget my time in Kenya. Alyssa was a fabulous partner who could conquer the world single-handedly so I am eternally grateful she let me tag along. Andrew and everyone at Cross World Africa opened my eyes to the heart and work of non-profits – thanks for all the help and advice. Judith and Tabitha were warriors for all their students – you ladies rock! Golda and Miriam have hearts bigger than the African continent. Timo, Sammy, and Victor shared their language, culture, and many laughs with this mzungu. Good luck and run fast to all the athletes especially George, Pete, and Trevor. So many more: Julia, Mary, Jeff, Toby, Sylvia, Sally, Betsy, Peter, Nick, Billy, Joseph, Muche, Regina, Mama Brian, the family who owned the grocery store, and Charlie & Lizzie. Best of luck on the SATs and college in America to Owen. And, of course, a huge and everlasting thank you to my family, loved ones, friends, and colleagues in the US who supported me on my great adventure.